To successfully launch a virtual event takes precise planning, implementation, and follow through. But before you can even begin thinking about presentation day, you need to entice people to sign up for your event. Tips on how to follow up with your attendees post conference... and more! 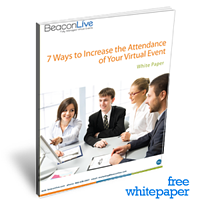 Download this white paper on webinar best practices today to ensure that your next virtual event does not fall flat. Get Our 7 Tips Today!